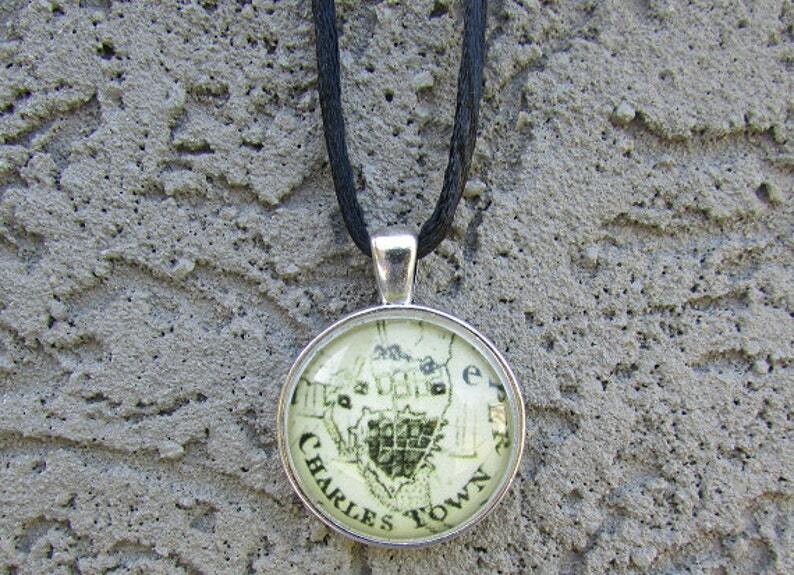 This vintage style necklace features a copy of a historic map featuring Charleston, South Carolina. The map is a sketch of the environs of Charleston and was published in 1780 by George F. Sproule. This necklace features a circular shaped, antiqued silver colored pendant that is 1 inch in diameter. The map has a light tan background and features a close-up view of the layout of Charleston. The necklace has a black satin cord that is 18" in length. Custom cord lengths are available. Include your custom length in the message box at checkout. You may also customize the color of the pendant tray; we have trays in antiqued bronze, antiqued copper and antique silver (as shown). If you like this map in a different colored tray please email me to discuss.